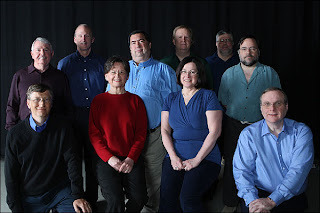 Steve Wood Left Microsoft in 1980 and has worked in the technology sector ever since. Bob Wallace Left Microsoft in 1983. Died in 2002. Jim Lane Left Microsoft in 1985. Stills works in software. 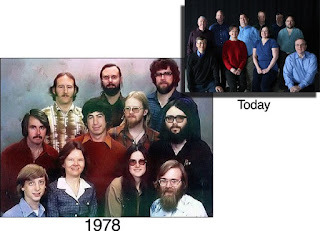 Bob O'Rear Had worked for NASA before joining Microsoft and was the oldest member of staff in the photograph. Left Microsoft in 1983 but stayed within the hi-tech sector. Bob Greenberg Responsible for organising the photo session. 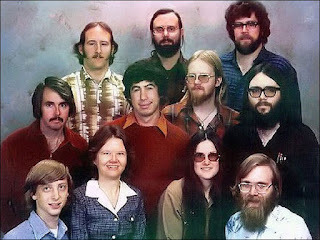 Left Microsoft in 1981. Is a member of the family responsible for Cabbage Patch dolls. Marc McDonald Generally credited with being Microsoft's first salaried employee. Left the company in 1984 because "it was getting too big" but returned to work there later. Gordon Letwin Left Microsoft in 1993. Is now involved with various environmental causes. Bill Gates Co-founder of Microsoft. Was 23 years old when the photograph was taken. Stands down from day-to-day control of Microsoft on 27th June 2008 but remains Chairman indefinitely. Andrea Lewis Left Microsoft in 1983. Has since worked as a journalist. Marla Wood Left Microsoft in 1980. Lives just outside Seattle. Paul Allen School friend of Gates, joint founder of Microsoft and one of the Microsoft billionaires. Withdrew from full-time involvement with the company in 1983 when he was diagnosed with Hodgkin's disease. Now engaged in a range of new enterprises from space exploration to bio-sciences. The Heavens Tremble with Diablo 3! PC Gilmore offers state-of-the-art floppy drive! Don't Mess with my Mom!